Syria "agrees to allow observers into the country"
But only in principle, a senior official said. The news comes as France called for the UN Security Council to act against President Bashar Assad. SYRIA HAS AGREED “in principle” to allow an observer mission into the country, a senior official in Damascus said today. The announcement comes as fresh anti-government protests erupted and France called for the UN Security Council to act against President Bashar Assad. The Arab League formally suspended Damascus this week over its crackdown on an 8-month-old uprising, which the UN estimates has killed more than 3,500 people. The group wants to send hundreds of observers to the country to try to help end the bloodshed. Syria has agreed in principle to the Arab League proposal (for observers) and we are still studying the details. Egypt state TV reported that the head of the Arab League, Nabil Elaraby, said he received “amendments” from Damascus, which the League is studying. Assad is facing mounting pressure from home and abroad over the country’s crisis, which appears to be spiraling out of control as attacks by army defectors increase and some protesters take up arms to protect themselves. The escalating violence has raised fears of civil war. We call on the Syrian opposition to avoid recourse to an armed insurrection. A civil war would of course be a true catastrophe. This would have to be within the framework of the UN Security Council. He also called on the UN Security Council to act against Assad’s regime, saying the time has come to strengthen sanctions against Syria. We must continue to exert pressure. The UN must act … it is not normal for the UN Security Council not to act. 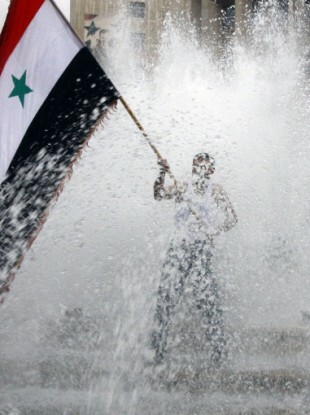 Syrian activists said at least five people were killed as security forces fired on anti-government protests today. Friday has become the main day for protests in Syria as thousands of people stream out of mosques following afternoon prayers. Email “Syria "agrees to allow observers into the country"”. Feedback on “Syria "agrees to allow observers into the country"”.